Inspection and maintenance of large industrial plants are important tasks expected of robots. 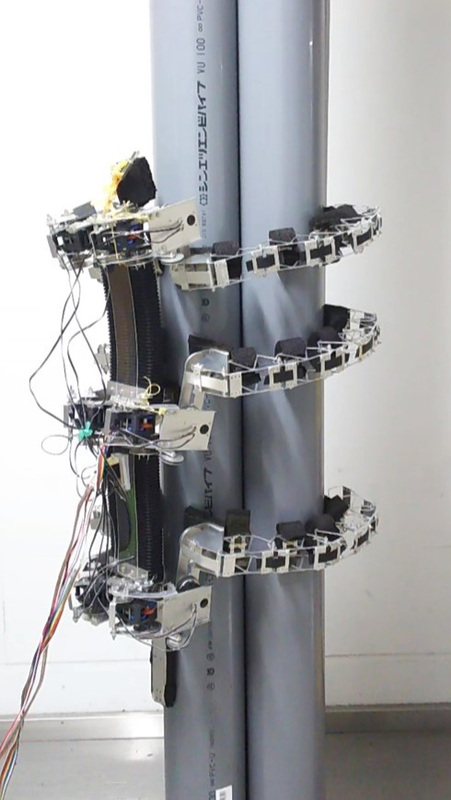 Furthermore, it is expected that an autonomous robot will be able to climb various arbitrary columnar objects, such as pipes, pillars, and trees. These tasks would be very difficult for conventional robots, because most must first assess the shape of the object and control many bodily degrees of freedom in order to climb. In our previous work, we developed a flexible manipulator, inspired by an octopus, which could grasp various objects without sensors or controls. Its flexible body passively adapted to differences in the objects’ features. In this research, we apply that mechanism to a six-legged climbing robot, which can climb arbitrary columnar objects without first sensing their shapes. K. Ito, R. Aoyagi, and Y. Homma, “TAOYAKA-III: A Six-Legged Robot Capable of Climbing Various Columnar Objects,” J. Robot. Mechatron., Vol.31, No.1, pp. 78-87, 2019. Y. Fujino, “Maintenance and management for safe infrastructure and efforts at SIP,” J. of the Society of Instrument and Control Engineers, Vol.55, No.2, pp. 117-122, 2016. E. Rohmer, K. Ohno, T. Yoshida, K. Nagatani, E. Konayagi, and S. Tadokoro, “Integration of a sub-crawlers’ autonomous control in Quince highly mobile rescue robot,” 2010 IEEE/SICE Int. Symp. on System Integration (SII), p. 7883, 2010. K. Ito and H. Maruyama “Semi-autonomous serially connected multi-crawler robot for search and rescue,” Advanced Robotics, Vol.70, No.7, pp. 489-503, 2016. Y. Sato and K. Ito, “Semi-autonomous modular robot for maintenance and inspection,” Proc. of the 12th Int. Conf. on Autonomic and Autonomous Systems (ICAS 2016), pp. 1-3, 2016. K. Ito and Y. Fukumori, “Autonomous control of a snake-like robot utilizing passive mechanism,” Proc. of the 2006 IEEE Int. Conf. on Robotics and Automation, pp. 381-386, 2006. Y. Kawai, K. Ito, and H. Aoki, “Passive stabilizing mechanism for snake-like rescue robot,” Proc of 13th Int. Conf. on Control Automation Robotics and Vision (ICARCV 2014), pp. 1740-1745. 2014. M. Masuda and K. Ito, “Semi-autonomous Centipede-like Robot with Flexible Legs,” Proc. of IEEE Int. Symp. on Safety, Security, and Rescue Robotics 2014 (SSRR 2014), pp. 1-6, 2014. K. Ito and Y. Ishigaki, “Semiautonomous centipede-like robot for rubble – Development of an actual scale robot for rescue operation,” Int. 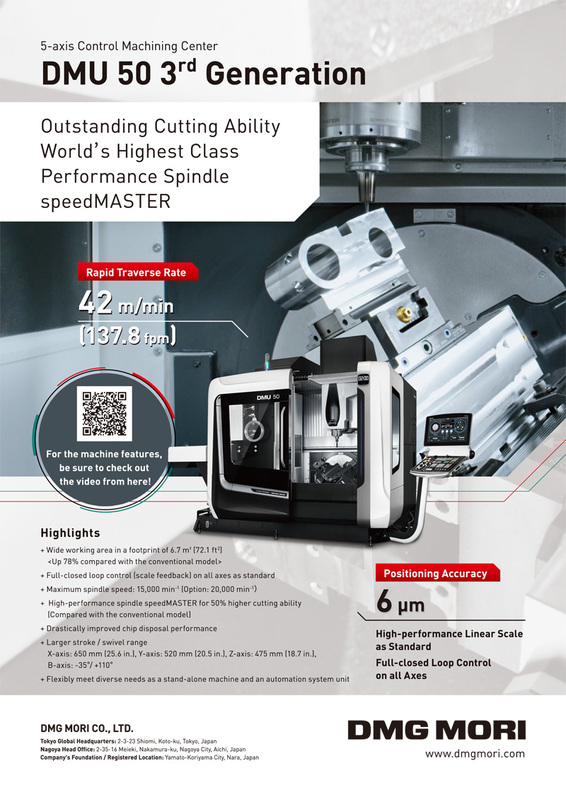 J. of Advanced Mechatronic Systems, Vol.6, No.2/3, pp. 75-83, 2015. P. Kriengkomol, K. Kamiyama, M. Kojima, M. Horade, Y. Mae, and T. Arai, “A New Close-Loop Control Method for an Inspection Robot Equipped with Electropermanent-Magnets,” J. Robot. Mechatron., Vol.28, No.2, pp. 185-193, 2016. P. Fankhauser, M. Bjelonic, C. D. Bellicoso, T. Miki, and M. Hutter, “Robust Rough-Terrain Locomotion with a Quadrupedal Robot,” 2018 IEEE Int. Conf. on Robotics and Automation, pp. 5761-5768, 2018. R. J. Griffin, G. Wiedebach, S. Bertrand, A. Leonessa, and J. Pratt, “Straight-Leg Walking Through Underconstrained Whole-Body Control,” 2018 IEEE Int. Conf. on Robotics and Automation, pp. 5747-5754, 2018. G. Sartoretti, S. Shaw, K. Lam, N. Fan, M. Travers, and H. Choset, “Central Pattern Generator with Inertial Feedback for Stable Locomotion and Climbing in Unstructured Terrain,” 2018 IEEE Int. Conf. on Robotics and Automation, pp. 5769-5775, 2018. K. Nagaoka, H. Minote, K. Maruya, Y. Shirai, K. Yoshida, T. Hakamada, H. Sawada, and T. Kubota, “Passive Spine Gripper for Free-Climbing Robot in Extreme Terrain,” IEEE Robotics and Automation Letters, Vol.3, No.3, pp. 1765-1770, 2018. K. Ito, K. Osuka, A. Ishiguro, and N. Furuyama, “Perception and Control Utilizing Property of Real World,” J. of the Robotics Society of Japan, Vol.24, No.7, pp. 807-811, 2006 (in Japanese). R. Pfeifer, F. Iida, and G. Gomez, “Designing Intelligent Robots – On the Implications of Embodiment –,” J. of the Robotics Society of Japan, Vol.24, No.7, pp. 783-790, 2006. C. Paul, “Morphological Computation: A basis for the analysis of morphology and control requirements,” Robotics and Autonomous Systems, Vol.54, No.8, pp. 619-630, 2006. D. Zambrano, M. Cianchetti, and C. Laschi, “The Morphological Computation Principles as a New Paradigm for Robotic Design,” H. Hauser et al. (Eds. ), Opinions and Outlooks on Morphological Computation, pp. 215-225, 2014. G. Sumbre, Y. Gutfreund, G. Fiorito, T. Flash, and B. Hochner, “Control of Octopus Arm Extension by a Peripheral Motor Program,” Science, Vol.293, No.5536, pp. 1845-1848, 2001. Y. Gutfreund, T. Flash, G. Fiorito, and B. Hochner, “Patterns of Arm Muscle Activation Involved in Octopus Reaching Movements,” J. of Neuroscience, Vol.18, No.15, pp. 5976-5987, 1998. K. Ito and S. Hagimori, “Flexible manipulator inspired by octopus: development of soft arms using sponge and experiment for grasping various objects,” Artificial Life and Robotics, Vol.22, Issue 3, pp. 283-288, 2017. S. Sano et al., “Development of wall climbing robot using passive joint and vacuum pad on rough surface,” 2017 Int. Symp. on Micro-NanoMechatronics and Human Science (MHS), pp. 1-3, 2017. J. Liu, Z. Tong, J. Fu, D. Wang, Q. Su, and J. Zou, “A gecko inspired fluid driven climbing robot,” 2011 IEEE Int. Conf. on Robotics and Automation, pp. 783-788, 2011. G. C. Haynes et al., “Rapid pole climbing with a quadrupedal robot,” 2009 IEEE Int. Conf. on Robotics and Automation, pp. 2767-2772, 2009. P. Liu, H. Yu, and S. Cang, “Modelling and dynamic analysis of underactuated capsule systems with friction-induced hysteresis,” 2016 IEEE/RSJ Int. Conf. on Intelligent Robots and Systems (IROS), pp. 549-554, 2016. P. Liu, H. Yu, and S. Cang, “Geometric analysis-based trajectory planning and control for underactuated capsule systems with viscoelastic property,” Trans. of the Institute of Measurement and Control, Vol.40, No.7, pp. 2416-2427, 2018. A. Saito, K. Nagayama, Y. Homma, R. Aoyagi, Y. Sato, K. Ito, T. Oomichi, S. Ashizawa, and F. Mastuno, “Multi-legged robot for 3-dimensional environments – Adaptive mechanism using flexible body and legs,” Trans. of the Society of Instrument and Control Engineers, Vol.54, No.8, 2018 (in Japanese).